Laura Cortese has been making substantial recordings for almost a decade, collaborating with the likes of Jefferson Hamer, Rose Cousins, Aoife O’Donovan, and Brittany & Natalie Haas. Her fifth project, Into the Dark, is where her potential matures into a compelling blend of traditional and pop-folk music. This is potent, rich music that demands repeated listening. Cortese fuses the new and old, as well as classical, folk, and pop influences, into one unified sound of her own that takes full form on Into the Dark. Using the talents of Hamer, Cousins, the Haases, fiddlers Mariel Vandersteel and Hanneke Cassel, Dirk Powell, and many others, Cortese crafts an acoustic wall of sound that propels her confident vocal delivery. Cortese’s voice gives us lyrics that blend the old and new just as powerfully as her compelling music. She jumps off from classical folk idioms (“Richmond boys they cheat and steal; Drinking brandy til they get their fill” starts the album on “For Catherine”) into modern issues like violence against women (“Broken bottle there I lay; Brandy mixing with cold clay”). The title track is a tour de force of writing, performance, production, everything – a tune that can be played on commercial, public, and community radio from pop to folk to trad. Many excellent albums have already appeared in 2013. 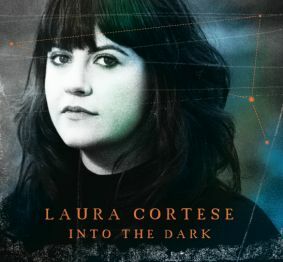 Laura Cortese’s Into the Dark could be the best so far.